VIENNA (Reuters) - Afghanistan risks becoming a "full-fledged narco-state" without international support to help create alternative jobs for its people, a senior United Nations official said on Wednesday. Yury Fedotov, head of the U.N. Office on Drugs and Crime (UNODC), painted a bleak picture of Afghanistan's narcotics problem before next year's withdrawal of NATO-led combat forces. He said the presence of those forces generates roughly one third of investment and jobs in Afghanistan, and that the gap when they are gone should be filled to prevent matters getting worse. A regular UNODC survey due later this month will show cultivation as well as production of opium increasing compared with 2012, Fedotov told Reuters in an interview. Afghanistan is the world's top producer of opium, from which heroin is made and which helps fund the Taliban's insurgency. "The situation is worsening, that is clear and very disappointing," Fedotov, a Russian national, said. It is "a very serious setback but we need to take that as a warning shot", he said, calling for redoubled efforts. 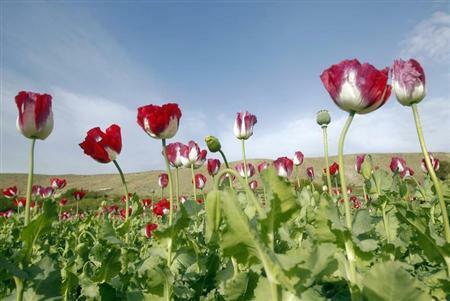 The Afghan government will need more help fighting poppy cultivation, once most foreign forces leave by the end of 2014, taking their cash and air power with them, experts say. Drugs provide funding for the insurgency and threaten regional stability and the health of people in Afghanistan, which suffers the world's highest addiction rate, Fedotov said. "That is also fertile ground for corruption and other forms of transnational organized crime. It is a multi-faceted challenge and we need to take that as a serious problem. "Otherwise we have a serious risk that without international support, without more meaningful assistance, this country may continue to evolve into a full-fledged narco-state," he said. Almost 12 years after U.S.-led forces invaded Afghanistan, large swathes are under Taliban control and Afghan troops still rely heavily on foreign air support, especially in remote areas. NATO plans to keep a training and advisory mission in Afghanistan after 2014, although the United States and its allies have been slow to provide detailed troop numbers. Fedotov said the political will existed in Afghanistan to fight the drugs problem, but increasing seizures, arrests and eradication efforts had so far failed to stem the tide. Afghan farmers needed better infrastructure and new markets for legal products, he said. More agricultural and industrial jobs were required for any shift away from the drug economy. "We have not been able to develop an alternative economy in Afghanistan," Fedotov said. "With all our efforts, it was very hard to move from illicit to licit."